A COMMON PIECE OF ADVICE you might hear if you’re approaching retirement: Don’t make major plans for your first year. Don’t plan to save the world. Don’t plan to be elected mayor. Don’t plan to master the piano and have your first recital at a major concert venue. Instead, just give yourself a year to get accustomed to the strange new reality of not going to work every day. As advice, it’s not a fit for everyone, and not a perfect fit for me, but it has its merits. I have ambitions about volunteering to help with trail work this summer on Lopez Island, or helping out with the food bank, or volunteering to help with the recycling operation at the Lopez Dump. But so far in the 9 months since ditching the daily work world, I’ve found plenty of demands on my time, just to get established in our new home. And, unashamedly, I’ve felt the need to indulge in pastimes and hobbies I just didn’t find time for in my previous life. Yesterday I bottled my first batch of home-brew beer. It will be ready to drink in two weeks (I’ll let you know how it comes out). Last week, while Barbara was in the city for medical appointments, I took over the dining table to work on a Revell car model that I got for Christmas. The “fleet” atop our fridge: pink Cadillac, Mini Cooper, VW Love Bug, Karmann Ghia, classic hot rod and a ’57 Thunderbird. Model building has been an on-again, off-again hobby since I was a kid. It’s something my daughter, Lillian, and I have done together since she was a youngster, and we have a collection of half a dozen completed models sitting atop the fridge in our cabin. We’ve never obsessed about perfection — sometimes the glue goes all over — but it’s been a fun father-daughter activity over the years. It’s a total geek fest, during which I can feel my blood pressure drop like mercury on a January night. This latest is a model of the first car I owned. I bought the car in my senior year of high school with my earnings as a busboy at a Chinese restaurant in Bellevue. It was a 1965 Chevy Impala two-door hardtop, which I called Ethel. It was a big tank of a car with a 283-cubic-inch V8 that never ran on more than about six cylinders, but it got me and friends to Lake Sammamish State Park for swimming on idyllic summer days in 1974. I bought it for $200 from a classmate’s father, who had put many miles on Ethel in his job as a salesman for Montgomery Elevator Co. The color was supposed to be “crocus yellow,” but tends a bit more toward canary melon or cantaloupe. At Christmas, Lil helped me with the first steps of painting and gluing. Last week, I proceeded to paint the body of the car, trying to duplicate Ethel’s pale yellow finish. (Chevrolet had called it “crocus yellow.”) But even after adding almost a full bottle of white to the bright yellow Testor’s enamel that was my base, the best I came up with was sort of a cantaloupe color. Oh, well. “Actually, it’s probably what Ethel looked like before the paint faded,” Barbara suggested, always the one to offer encouragement. I expect some will say, “Poor Brian doesn’t have enough to do up on that island.” But don’t feel bad for me. I’m delighted to return to one of the simple pleasures of my youth. Hoppin’ John, a New Year’s Day dish popular in the South, is hearty comfort food that’s just as tasty on an island in the San Juans. WE TRIED SOMETHING NEW for our New Year’s Day dinner: Hoppin’ John, a black-eyed pea dish from the Carolinas that’s said to bring luck and prosperity in the new year, and who couldn’t use more of that? It also fit our vegan diet, with peas and rice as the main ingredients. To the Center Island version Barbara added peppers, carrots, celery, garlic and purple shallot along with some seasoning salt in place of the Creole spices we didn’t have in our cupboard. Some variations also feature ham hock, bacon or country sausage, among other things. Here’s a link to a classic recipe from Southern Living magazine. Chopped celery, carrot, shallot and garlic joined black-eyed peas and rice in our slow cooker on New Year’s Day. Tradition has it that the black-eyed peas are symbolic of pennies, and a coin is sometimes added to the pot (a tooth-breaking ingredient we omitted). Another traditional addition to the dinner is cornbread, adding more prosperous overtones because of its gold color. And there’s all sorts of other quirky culinary symbolism built up around this simple comfort-food dish. We’re also following the tradition of having the leftovers for dinner on January 2, when the name changes to “Skippin’ Jenny,” connoting even more prosperity based on the frugality of eating leftovers instead of throwin’ ’em to the hogs. Or, on Center Island, atop the compost pile. Barbara dubbed this a hen party of female purple finches at our feeder this morning. As with peacocks, the boys get the flashy color. WE HAVE A FLASH MOB at our bird feeder on this mild and sunny New Year’s Day in the San Juan Islands. We just counted 12 birds vying for a spot at the food trough. The forecast is for rain and winds to return for the rest of this week. One of the local avian meteorologists must have tweeted a warning to stock up on winter rations. Barbara and I are keeping a New Year’s Day list of birds we see out our window. So far we have purple finches (male and female), spotted towhees, red-breasted nuthatches and black-capped chickadees. Yesterday, a New Year’s Eve bonus included two bald eagles circling high in the blue sky above Nuthatch Cabin, riding the air currents for a good half-hour without flapping a wing. It gave me a shiver (the good kind) every time the golden afternoon sun glinted off their white feathers. As the rains return, there’s fun to be had inside. One of my Christmas treats was a beginner’s home-brewing kit, indulging a long-held goal of making my own beer (inspired some 30 years ago by newspaper colleague Michael Zuzel’s home brew, which he named “Cape Alava Ale” after a favorite Olympic Coast hiking destination, with the motto, “You can’t get any Wester”). Oh, the anticipation: Your faithful correspondent can’t wait to fill his glass from the jug of brown ale brewed in The Nuthatch’s kitchen a couple days after Christmas. The gadget atop the jug allows brewing vapors to escape without allowing foreign bacteria to get in. Two days after Christmas, daughter Lillian and I brewed up a gallon of English brown ale, which should be ready to bottle in a couple of weeks. I’ve limited myself to small batches because we live in a small cabin without a lot of extra space for beer gear. Because beer-in-the-making likes a dark, quiet spot with controlled temperatures (as many of us do) I’ve built a cozy nest for the gallon jug in a corner of our bathroom. The jug is wrapped in towels and sits next to an oil-filled radiator that keeps it around 65 degrees Fahrenheit, so the yeast can happily consume the malt syrup (creating alcohol). In coming weeks I’m also looking forward to spending time in my writing hut working on a new mystery novel. Perhaps while sipping an English brown ale. I’ll let you know how that turns out. Last year, we had a white Christmas on Center Island. This year, we have nasturtiums still blooming in the pot on our deck at The Nuthatch. They’re lovely. But here’s wishing for a new year in which those with power to effect change start taking global-warming seriously and saving the planet for our grandchildren. A winter bouquet of wild Nootka rose hips, snowberries and salal, all gathered on Center Island, decorates The Nuthatch cabin’s entry. AFTER MORE THAN A WEEK OF LASHING WINDS, this winter solstice brought peace to our bit of Earth: a calm day of weak but welcome sunshine on Center Island. On the way there, WeLike threw us a challenge. The boat’s big Evinrude lost power 100 yards from the Hunter Bay dock. It didn’t stop, it just slowed dramatically, so we were able to creep up to the dock. Probably a clogged fuel filter, possibly easily solved. It meant we used our little 6-horse kicker motor for the return trip. A slower crossing, but we made it. On our isolated island, we’re welcoming the solstice. The days have been so short. We notice it much more now that whim and serendipity rule our days rather than office schedules and commute times. In practical terms, it means I have less time to chop firewood in the afternoon, or that we have to head home from Lopez by 3 if we want to be in before dark. As seen in our tree-filtered view from The Nuthatch cabin’s deck, the winter solstice sun sets around 4 p.m. over Lopez Sound. Tonight an all-but full moon will light up the night along with the Christmas lights that decorate our deck rail. Before bedtime last night I stepped out and saw the distinct shadow of our cabin cast by a moon that shone like a locomotive’s headlight in the inky sky above. Appropriately, the December full moon is called the Cold Moon. Tonight we’re lighting candles and feeding a fire to celebrate the turning of the season. Like ancient Druids, we look forward to the return of longer days. On our little island, sunrise and sunset set the rhythm of our lives. The Nuthatch’s brightly lit Christmas tree, an 8-foot Nordmann fir, helps fend off the winter gloom outside. It made a long trip to get here. IT’S JUST AFTER 5 P.M., pitch dark and blowing like stink, a few days before the winter solstice. It’s been blowing for a week. The 100-foot firs around our cabin are swaying like willow saplings. Branches break and fall with loud thunks on our metal roof. It’s unnerving, and a little scary. 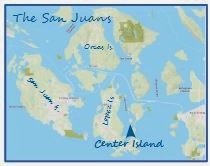 On this isolated island in the San Juans we’re more isolated than usual. Gusts to 50 mph mean we don’t venture out on our boat, even for the quick trip across Lopez Sound, where wind-driven whitecaps do a frothy tarantella. Amazingly, we still get mail every day through the U.S. Postal Service — that “neither snow nor rain nor heat nor gloom of night” thing apparently includes wind, though I worry about the postal contractor who risks his life crossing Rosario Strait in a small boat to deliver Christmas cards to us. United Parcel Service isn’t so intrepid. No hunky guys in brown shorts make it out here. They contract delivery by plane to our grass airfield. From Anacortes, our packages go by ferry to a base in Friday Harbor, from which the small orange planes of San Juan Airlines fly them to Center Island. But they don’t fly when it’s too windy. We’ve had packages sitting in a warehouse in Friday Harbor, nine miles away, since last Tuesday, including some key Christmas gifts destined to go under our tree — providing they get here. Comet, Cupid, et al, where are you when we need you? Getting a Christmas tree here was a challenge in itself. It might seem silly to buy an 8-foot tree in Seattle and bring it to this forested island — coals to Newcastle, right? — but we don’t have enough trees of the right size on our property to harvest one every December. So we found a nice specimen at Home Depot, rolled it in a tarp like a giant holiday burrito, secured it with duct tape and lashed it to a bike rack on our Honda Civic for the 70-mile freeway drive to Anacortes, followed by a bouncy trip across Rosario Strait on the Paraclete Charters water taxi. Wrapped up like that it looked a bit like a dead body, so we referred to it as “Uncle Fred” when friendly folks helped us hoist it on and off the boat. The nice Nordmann fir Barbara picked out this year made the trip just fine and looks dandy just inside the front window of The Nuthatch. We decorated it yesterday and today encircled it with the customary model train set. When the train whistle blows, we can’t hear the wind roaring outside. Whoo, bloody whoo!